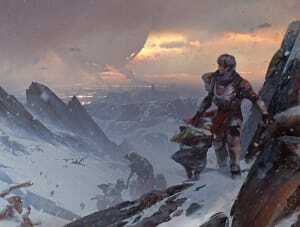 The official Destiny 2 fine art print collection consists of multiple museum-grade quality prints made from original concept and production artworks used in the development of the Destiny 2 video game. This collection is curated by the experts from Cook and Becker and Bungie. Each print is hand-numbered and comes with a Certificate of Authenticity. 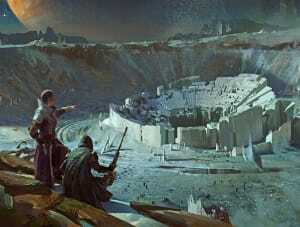 You can find more Destiny art in the gallery for the first Destiny video game. Destiny 2 is a first-person shooter video game developed Bungie Inc. released in 2017. Expanding on the narrative of the hugely successful Destiny (2014) video game, players in Destiny 2 once again assume the role of Guardian to defend humanity against alien foes, on earth and on other planets in the galaxy. Guardians at the start of the game find themselves stripped of their powers after an alien race, the Cabal, attack the last safe place for humans on earth, and put the Traveller in chains – a planet-sized entity hovering over the Last City, protecting mankind. At the festival, Van Dijk explained at length how the ‘world-building’ of Destiny 2 actually worked, and how the various teams at Bungie co-create the ultimate user experience. The art team would create art to ‘serve the player fantasy’, the minute-to-minute gameplay, and the game’s story progression, synchronising their efforts with other teams to embellish gameplay. Combat for instance has to be ‘easily readable’ to ‘work’ for players - a tenet with great consequences for the overall design of the game. Friends have to be distinguishable from foes, up from down, and floors are best decorated with some kind of pattern: a player looking over the barrel of a gun has no way of telling he/she is moving when an environment doesn’t give movement cues. Long, milky white corridors may work in science fiction movies, in video games it will have the player doubting if the input controls are in working order, breaking immersion and player concentration. Of course, the art of Destiny 2 is about much more than mere ‘readability’ and utilitarian use of art assets. Thematically, Destiny 2 closely follows the ruleset of the first game. 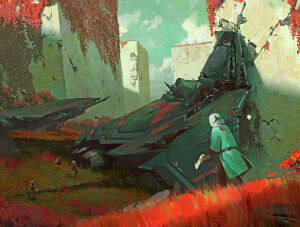 The overall visual theme is described by Bungie’s artists as ‘mythic science fiction’, combining fantasy tropes with those of sci-fi stories, the Guardians being the most obvious examples of this principle. Their armor is distinctly mecha-robotic and futuristic, while things like flags, cloaks and ornaments are rooted in medieval fantasy: the brightly colored heraldic adornments suggest feudal origins. Another design principle is called ‘idealised reality’, meaning the art team sought to find a game world that would be fantastic yet relatable, mythical yet familiar - Van Dijk used the words ‘semi-plausible’ for some of the designs: “think of ideas like: Dubai in space.” While developing the first game, the art team found inspiration in collecting visual ‘touchstones’; images ranging from Western movie stills to Manga art to 1970’s futurism illustrations from artists like John Harris, Zdzislaw Beksinski and Peter Gric. From these sources they extracted visual cues for their own world, gradually landing on an iconography that was different from other video game worlds, yet builds on a shape-language well established in modern fiction. The newfound iconography was further enhanced through the consequent use of tonal effects: the Destiny games have a relatively high color saturation, yielding an overall look that’s buoyant and optimistic. Color palettes support this by leaning towards the non-traditional, to allow artists to show established shapes while at the same time distancing them from established looks. In the end, Destiny 2 is seen as a futuristic game world that strongly resonates with our own. Players may find themselves fighting on planets they never heard of, their fight is for humanity. They may don exo-suits that have no real-life counterparts, yet they are culturally familiar for anyone raised on cartoons and anime. Also the scenes they encounter while blasting away may be ‘semi-plausible’; the fun of playing this marvelous looking game is very real.